345 Commonwealth is located on the north side of Commonwealth, between Hereford and Massachusetts Avenue, with 343 Commonwealth to the east and 347 Commonwealth to the west. 345 Commonwealth was designed by architect Frederick A. Norcross and built in 1925-1926 on a vacant lot. It was built as a ten-unit apartment building. Before it was completed, it was converted into nine apartments and one dentist’s office. 345 Commonwealth was built for Henry Berch and Neil S. Cadigan, partners in the firm of Berch & Cadigan, steam heating contractors and real estate dealers. They are shown as the owners on the original building permit application, dated February 14, 1925. Henry Berch and his wife, Bessie (Gordon) Berch, lived in Mattapan, and Neil Cadigan and his wife, Alice L. (Cronin) Cadigan, lived in Medford. The lot previously had changed hands several times and originally had been two lots which were combined by Nehemiah Webster Rice: a 25 foot lot to the west he purchased on March 23, 1881, from Henry Kenney Horton, Jr., and a 3 foot wide lot to the east he purchased on May 8, 1882, from Fanny Pope (Hovey) Morse, the wife of John Torrey Morse, Jr. Henry Horton and Fanny Morse both had purchased their lots on January 9, 1880, from Grenville T. W. Braman, Henry D. Hyde, and Henry M. Whitney, trustees of a real estate investment trust that had purchased several parcels of land on March 1, 1872, from the Boston Water Power Company. 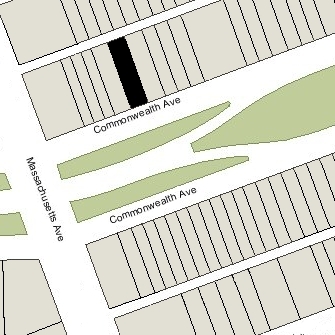 Click here for an index to the deeds for 345 Commonwealth, and click here for further information on the land on the north side of Commonwealth between Hereford and Massachusetts Avenue. The first residents had moved to 345 Commonwealth by the 1926-1927 winter season. On April 27, 1927, it was purchased from Henry Berch and Neil Cadigan by Philip Rosenfield. The firm of Berch & Cadigan declared bankruptcy the next month. Philip Rosenfield was a junk dealer and operated an automobile wrecking company in Chelsea where he and his wife, Celia (Slotnick) Rosenfield lived. On May 16, 1929, 345 Commonwealth was acquired from him by his brother-in-law, Solomon Slotnick, operator of a stone monument company in Chelsea. On December 5, 1932, the New York Life Insurance Company foreclosed on a mortgage it held on 345 Commonwealth and took possession of the property. On September 2, 1941, 345 Commonwealth was acquired from New York Life by real estate dealers Mitchell & Driscoll, Inc. The property changed hands and on July 13, 1943, was acquired by Frederick H. Buckley, a lumber dealer, and his wife, Mary J. (McElaney) Buckley, trustees of the Leamington Realty Trust. On June 14, 1945, they transferred the property to themselves as individuals and not as trustees. Frederick Buckley died in September of 1945. On June 3, 1946, the three upper floors of 345 Commonwealth were damaged by fire. On October 25, 1948, Mary Buckley transferred the property to herself as trustee of the Leamington Realty Trust. That same day, 345 Commonwealth was acquired from Mary Buckley by Arthur Haffer and his wife, Hilda D. (Hurwitz) Haffer (one-half undivided interest), and Jacob Mandell and his wife, Mildred (Haffer) Mandell (one-half undivided interest). The Haffers lived in Brookline and the Mandells lived in Mattapan. Arthur Haffer and Mildred (Haffer) Mandell were brother and sister; their brothers, William Haffer and Harry Haffer, were partners with Jacob (Jack) Mandell in the firm of Haffer-Mandell, dealers in heating apparatus. On May 11, 1953, 345 Commonwealth was purchased from the Haffers and the Mandells by Dr. Howard Cartnick Reith and his wife, Frances Ellen (born Frances Eleanor Lillian) (Gardner) Reith. He was a dentist and maintained his office at 370 Commonwealth; they lived in Winthrop. In July of 1953, Frances Reith filed for (and subsequently received) permission to legalize the occupancy as twelve apartments, indicating that was consistent with the previous owner’s agreement when she purchased the property (implying, thereby, that it was an existing condition). On September 27, 1963, the Reiths transferred 345 Commonwealth to the Reith Realty Corporation. 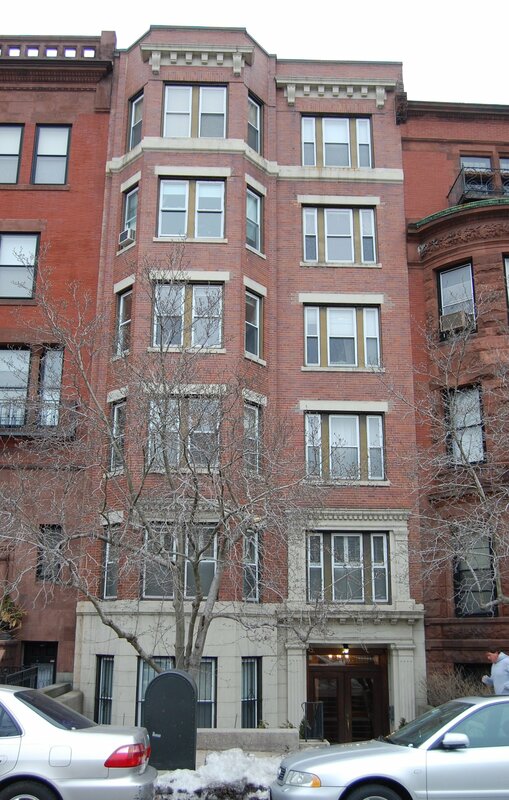 On November 17, 1971, 345 Commonwealth was purchased from Reith Realty by Eliot Warden Denault and his son, Eliot Denault, Jr., as trustees of the 307 Beacon St. Trust. Eliot W. Denault, Sr., was a real estate investor. He and his wife, Marcia (Bartlett) Denault, lived in an apartment at 401 Beacon. Eliot W. Denault, Jr., was owner and operator of oil storage tank facilities. He and his wife, Dorothy (Bartels) Denault, lived in an apartment at 354 Marlborough. On November 30, 1973, the Denaults transferred 345 Commonwealth to the Elden Corporation, which Eliot Denault, Sr., had formed in 1966 to own and manage his real estate holdings. On April 25, 1986, Elden Corporation transferred the property to its affiliated entity, Cameron Real Estate, Inc.
On July 24, 1986, 345 Commonwealth was acquired from Cameron Real Estate, Inc., by Joseph F. Perroncello, trustee of the 345 Commonwealth Avenue Realty Trust. On September 30, 1986, he converted the property into twelve condominium units, the 345 Commonwealth Avenue Condominium.